“Although baby boomers have a very positive view of aging, there is an overwhelming level of denial regarding the likelihood of needing long term care." Long Term Care can be defined simply as care provided by another party for the benefit of someone who is unable to care for themselves because of aging, an illness, or a disability whether temporary or permanent. It can include help with daily activities at home such as bathing and dressing, intermediate care or assisted living, to skilled nursing care in a nursing home. You won't need long term care insurance if you don't plan on getting older. You have 5 options for financing long term care. 2. Medicaid: requires poverty level income and assets. 3. Long term care insurance: high leverage, Medicaid protection in most states. 4. Life insurance with a long term care rider: death benefit, return of premium. 5. Annuity with a long term care rider. Many will spend their life savings and retirement for long-term care. The only thing protecting you today from the expense of care is your health. 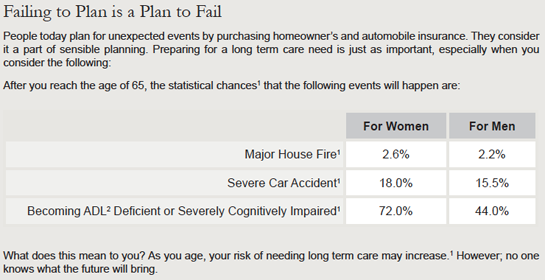 Prepare for long-term care while you still have choices. Do you believe you are going to live a long life? Do you think may need assistance because of age, illness or accident? Do you realize that your health could change at any time leaving you uninsurable? Are you comfortable continuing to self-insure the entire cost which can range from $50,000 to over $150,000 a year? Long term care planning can protect your income stream -- you might say that long term care planning provides the peace of mind that in the event that you need extended care your family's lifestyle could remain intact. Even if you buy a policy that covers half the risk you won't be on the hook for the entire cost and your premium may be affordable. Right now you are self-insuring. The only way to prepare for your future is to sit down and plan it. 1. American Association for Long-Term Care Insurance, 2010 AALTCI Sourcebook. 2. Activities of Daily Living (ADSs) includes: Bathing, Continence, Dressing, Eating, Toileting and Transferring as defined in the Policy.